While attending a historic art festival, Shane discovers a missing document hidden behind a piece of art. He's handed a chance to find treasure, but it's an adventure that could get him killed. As he runs from the Galactic Government, he hides in an abandoned hotel where he meets Ariel. Together the two embark on an adventure that will change their lives. While Ariel seeks a fresh start, Shane is determined to rescue his girlfriend, Shanda. His search for treasure brings them to an unexpected alien ally and together they make a startling discovery. Shane is pulled into the middle of a war as a new emperor takes the throne and merges the empire with the Universal Expanse Church. 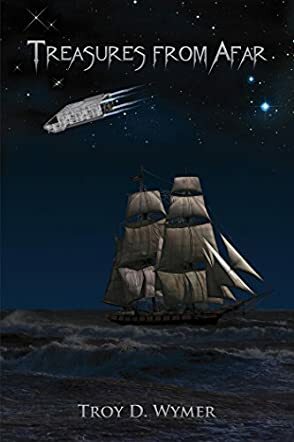 In Treasures From Afar, author Troy D. Wymer plays with multiple meanings on the idea of treasure as Shane discovers that treasure comes in various forms. A surprising twist on the treasure everyone is seeking reflects the overall plot dealing with religion and government. It's unexpected, but also fits perfectly into the world Wymer has created. The most important treasure comes in the form of the relationship he has with Shanda. On the surface the story feels like a treasure hunting adventure, but Wymer digs deeper into this gritty world by tackling a controlling government and freedom of religion, while also exploring a sweet romance. Through various perspectives different aspects of this world are explored, giving a well-rounded view of the war against the empire and church as these characters are pulled into the middle. Wymer tackles the idea of freedom through the control of the empire which forces specific beliefs onto the people, while also exploring second chances for many of the characters. Ariel is living off the Galactic Government's radar, but what she truly wants is a fresh start and finally gets her chance when she meets Shane. He's the first one to really be nice to her and forms a genuine friendship with her. He gives her a real opportunity to find a new life for herself. Shane has a personal journey as he's been separated from Shanda for about a year so he wants nothing more than to get her back. Their romance adds a sweet undertone to the story as they have someone that grounds them through everything they experience. Treasures From Afar is an action adventure mixing treasure hunting fun with a science fiction setting. Giving Treasures From Afar a big Thumbs Up!!! I’m not usually a big sci-fi fan, but this book captivated me with its easy reading, very descriptive flow of intergalactic adventure! I thoroughly enjoyed Treasures From Afar. It was interesting how the search for the treasure started with a painting from an art festival. It was nice to see Ariel make some great life changes with Shane‘s help. I enjoyed that Shane was able to reunite with his love. I like the fact that both the humans and the aliens came together for a great cause. I give it 5 stars!! !